Dumb down, deeper and down? Quick on the tail of the, erm Long Tail, The Register now takes a new pot shot at Malcom Gladwell, author of Tipping Point: “The dumb, dumb world of Malcolm Gladwell“. Subtitled “A guru for the brain dead”, Andrew Orlowski’s article is a stiff piece of polemic, while also taking nifty side-wipes at Britain’s liberal intelligentsia (there must be a neologism lurking there) and at Corporateville, identifying what he calls the ‘Vertical Marketing Bureaucrat’. The common factor between these bureaucrats and their counterpart in the Public Sector is for Orlowski, their fondness for monitoring and measurement. Now maybe I’m a bit too biased, but I’m not so sure that measurement itself is a bad thang. Vertical marketing is like horizontal collaboration, it very much depends on the depends – get it wrong and it’s tars and feather, get it right and it’s stars and stripes. In terms of measurement itself, the key factor is what’s measured. A common misery here (or at least as we’re told by those that lament as such), is that the measurements desired by New Labour Bureaucracies are simply not quite right – the targets are not bull’s eyes but emanate from the other end of the bovine equation. But getting back to Orlowski’s piece, I wonder if what we’re seeing here is the start of a trend to demand the hard facts – in God we trust and all that. For long the Environmentalist lobby has proclaimed the supremacy of hard data against those that doubt their prognosis (too much to close down the chatter some say). Are we though seeing others begin to demand the same scrutiny? 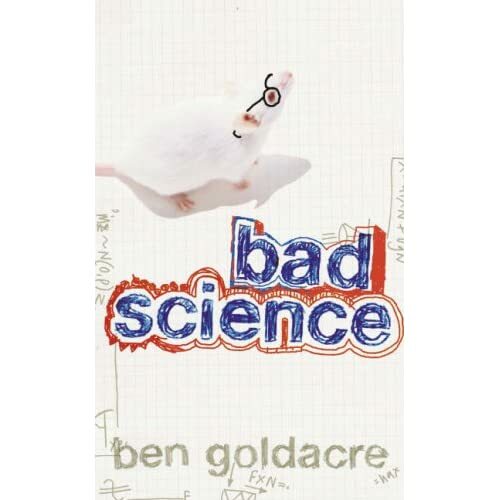 The Register is on a mission and then we have Ben Goldacre’s “Bad Science” hitting the window-displays for Xmas, plus “Street Science” a new series from Radio 4 that promises/threatens to look at GM crops and Human-Animal hybrid research with an open eye, or should that be ear? I like to think of it as an intellectual adventure story. […] I think it will appeal to anyone who wants to understand the world around them in a different way. I think it can give the reader an advantage–a new set of tools. Of course, I also think they’ll be in for a very fun ride.